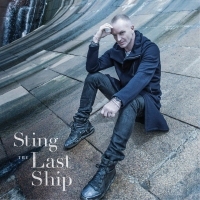 Music legend Sting is back with his first full-length LP since 2003 and "The Last Ship" recently began its sail around the world. Inspired by the composer, singer, women's activist and actor's forthcoming Broadway play of the same name, the album draws upon childhood memories amongst other relationship related issues. Sting, a former primary school teacher, has talked about impactful, and sometimes awkward moments growing up near a shipyard in Newcastle. One of the most defining in his life was discovering his mother with her lover. Looking inside himself led to his musical career that has lasted a quarter of a century. During that time, he has earned 16 Grammy awards and sold nearly 100 million albums from his time with The Police and as a solo artist, with smash hits like "Roxanne" and "Englishman in New York". Getting in touch and interviewing the father of six with the twinkling blue eyes definitely wasn't an easy job. But I finally got the chance, mostly because his Pilates trainer and my friend, Lara Hassan, made it possible. Once we started, my main concern was asking him about his past, what moves him to write, his love for Arab music and his interests. Why do you call yourself Sting? Sting is a nickname I've had since I was 19. I got it because I used to wear a sweater like a bee, yellow and black. It was a silly name, it still is a silly name but that's what people know me as. It used to suit me more, I used to be more stingy, but now I'm much more gentle. Let's start with your latest album, "The Last Ship", which you launched in September. Why is this album so special to you? You said you couldn't sleep because you were so focused on it. Well all albums are special to me; an album can take two or three years to complete, from thinking about the ideas to realising them. I think exclusively about a project, and this latest one is very special to me because I'm singing about my community. I was born in the north of England, and I'm singing about the community I was raised in, the people I knew and about the death of their industry. The album, as you mentioned, reveals your memories of the Swan Hunter's shipyard at the end of your street. To what extent are you stuck in the past? I think it's important to go to the past sometimes because it's only then that you can understand why you are thinking the way you do and why you are behaving the way you do. And it's only with a certain amount of distance you can do that exercise, when you're in a situation you can't see it for what it is. I had a very confusing childhood in a very confusing place, I lived in a very surreal industrial landscape and I had no clues about what I was meant to do there. I knew I didn't want to work in the shipyard but I had no ideas about what else I could do. I wanted to go back there to revisit so I can figure out where I am now and why I made decisions to do that. You spend a lot of your young life trying to escape where you came from, but as you get older, you tend to go back, either in your imagination or as if there is a homing signal in your head, home is very important. During an interview with "The Huffington Post" you said "The Last Ship" was a way of telling your story through other people. Tell us your story and why it felt better putting yourself in others' shoes? I think songwriters can spend a lot of time looking inward, looking inside themselves and after a while it gets boring because there is only a certain amount you can pull out of yourself. So as a songwriter at my best I can sing other people's stories, It's like identifying with other people's stories and telling them in a very poetic way. In many ways it's a much more heightened art than just looking into yourself, but in telling other people's stories you recognise part of yourself too, so I'm doing both. I'm telling someone else's story and I'm telling my own. Is " The Last Ship" a continuation of "The Soul Cages"? This isn't the first time I've tackled this subject. In 1990 I made an album called " The Soul Cages", which was also about the death of a shipyard and I used that as a metaphor for the death of my parents, which happened at the end of the ‘80s. Speaking of your parents, you have written a moving piece about your father's hands. Can you tell us the story? I was with my father when he was dying and I held his hands. For the first time I realised we have exactly the same hands and I said to him, ‘We have the same hands, exactly the same shape.' He answered, ‘Yes, but you used your hands better than I used mine,' and it was the first compliment he ever paid me so its timing was devastating. "The Last Ship" is your first original material in a decade. How did you regain a creative urge? I got sick of looking inward and I was unwilling to put myself on the table for observation and comment so I immersed myself in other people's compositions. I did lots of work, I did three albums but other people wrote the work I put on record. I make my living as a songwriter so I said, ‘I'm going to write somebody else's story.' By doing that, it pushed me to do what I do best, which is to write songs. How would you describe your relationship with the media? You didn't attend your parents' funeral because of the paparazzi. I don't want to generalise about the media, you know, there are good journalists and there are people who aren't so good. Sometimes I was treated well and sometimes I was treated badly, it's just part of the job. My job is not to complain about that, just to get on with my work. I'm fine with the media, they have their work to do and I have mine. Tell us about your love of Arabic flavoured music, which led you to record the remarkable song "Desert Rose". I was living in Paris for a while and became familiar with Rai music, and I got to know Cheb Mami well and people like Khaled. I love its rhythm; I find it has elements of Western pop music and also a flavour of the exotic east. I played Cheb Mami this music and I said to him that I want him to sing some Arabic lyrics, but I didn't tell him what the song was about in English. The song was about longing, longing for something unattainable, anyway he came back with some lyrics and they sounded great. I asked him what he was singing about and he said it was about longing, and it proved we were both writing the same kind of thing. It was a huge hit all over the world and in the Middle East and I was very proud of that. We heard you love the desert and have visited many Arabic countries. In a "Daily Telegraph" interview you even said crossing the deserts of Rajasthan was one of your best journeys. Why is the desert special to you and is it different to what most Westerners visualise? I love the desert. I think most Westerners think of the desert as one thing, that is lots of sand, while in fact it's usually very landscaped, and in rainy seasons it's very fertile and lots of flowers grow; it's very beautiful. I think it symbolises the complexity of the Middle East in many ways, and I think Westerners tend to think very simplistically about the Middle East as being kind of monolithic in one thing, while it's a very rich, textured culture and we need to understand that better. But again nothing is as it seems from the first sight in the region, it's more complex. You have supported many charities, which one is closest to your heart? They are all important, I'm very keen of the environment, and as I get older I think working on women's rights is probably the most important thing we have to do on the planet. When women are treated well, society improves and that's true everywhere. I'm very interested. In fact, I want to live in a world where women are treated well, it's better. You have been practicing yoga for 21 years. Tell us more about this journey. Yoga interests me because it's so difficult. I've done it for 20 years and I'm still a beginner and so curious about it. You know it's a purely physical practice, if it leads to a spiritual enlightenment at some point I will be happy to receive it but it hasn't so far. I enjoy finishing a yoga session and I'm very receptive but does it make the world a better place?